If it drives, flies, or floats... Foam it! With the All-New MTM Hydro Magnum 28 Gun & Foam Kit getting dirty never looked this good! Eliminate the risk of swirl marks when you apply thick foam onto your vehicle, truck, boat, house, or restaurant grill & hood. 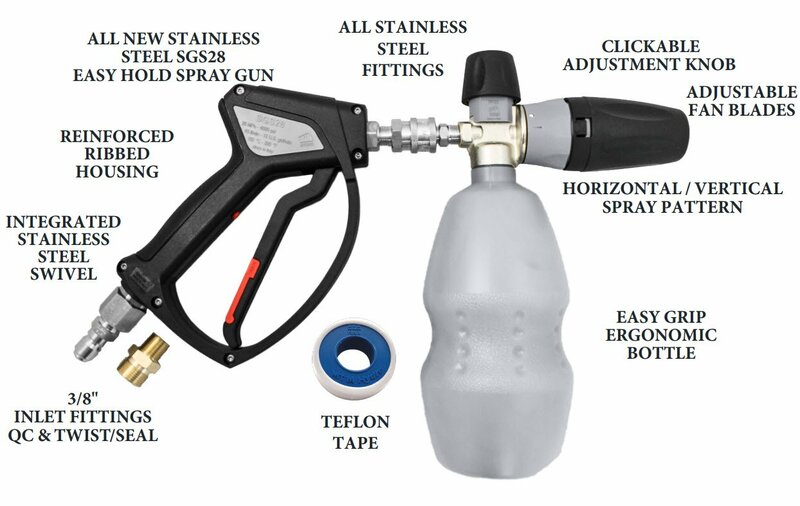 This kit includes the brand new Stainless Steel SGS28 Easy Hold Spray Gun with built-in stainless steel swivel, PF22 Foam Cannon, stainless steel fittings, and a roll of Teflon Tape. WARNING: This product can expose you to chemicals which is [are] known to the State of California to cause cancer and birth defects or other reproductive harm. For more information go to www.P65Warnings.ca.gov. The Innovation of the PF22 Foam Cannon lies in the nozzle. This foam cannon offers not only adjustable fan blades but now offers an adjustable spray pattern (vertically or horizontally) as it throws thick foam onto your vehicle, house, fence, sidewalk, roof or other washable items. The chemical injection knob on top allows for more or less chemical to be drawn through the internal chamber, increasing or decreasing the foam output. This allows the internal agitator to create a dense foam. Use the brass threaded fitting pictured at the bottom of the gun to attach to the Karcher hose. Or purchase separate a quick connect for your hose to us the stainless fitting at the bottom of the gun. Best deal online! I’ve looked everywhere and they have the best prices for everything! Item came with the fittings already on! While some places don’t come with fittings! Definitely going to order all my detail supplies from here!